FN Herstal’s 21st-century battle rifle, the FN SCAR 17 is a long range platform capable of hitting hard out to 800 yards effectively. If you want shots out to ranges that far, you are going to need the best optic for a SCAR 17 you can get. To assist, we formulated this simple guide and found a few high-quality recommendations to get you the best performance possible. How to Choose Scar 17 Optics? The scope you get should do everything possible to work with the strengths of the .308 cartridge. At the same time, having an optic that can transition from long range to CQB along with your rifle is a strong consideration. Considerations like low-light shooting are an important factor. As is the overall power of the scope and its many features. Whether you plan on using your rifle as for personal defense, range time, or even hunting, it is best to consider how it will perform in those situations. This guide should take you through the available options. When we look for an optic, magnification is often the first thing we consider. Scopes come in a wide range of possibilities from as low as 2 or 4x up to 20x or higher. Each of these is suitable for specific ranges but weaker than others. Being a .308, a SCAR falls better into the more moderate power scopes unless you plan on having a dedicated long range rifle. Something maxing out around 14 power will get you everything you could possibly need out of a .308 out to its maximum range. If you want a rifle capable of performing in a more medium range capacity, stick to a maximum of around 8x. These are perfect for most hunting applications but may be a little high powered for any personal defense needs. Shorter powered optics around 4x are great for personal defense and will still allow you to accurately engage targets out to a couple hundred yards. It won’t do for precision work at long range but it will be quite sufficient for larger targets. The other option which may work quite a bit better to cover all of your bases would be to pick a variable powered scope. These are perfect for allowing you to do both precisions shooting at long range or to scale things back for shorter work. Due to the length of the tube, they often won’t work quite as well as a dedicated short-range optic but for versatility, they are hard to beat. The overall size of your objective lens, while often disregarded, is as important a factor as the magnification. In fact, they two go hand in hand to provide you the quality image you want. An improperly sized objective lens will make a scope image dull and dark. There is a maximum size that is convenient to fit on your rifle. An objective that is too large will require special rings to mount and can make your rifle unwieldy. This is rarely a consideration until you get into the cheaper scopes that use the objective to make up for having bad lenses. The primary job of the objective lens is to collect light. As your scopes magnification increase, it will take more light for the scope's image to appear as bright as normal vision. If you want a scope capable of shooting in lower light, having an appropriately sized objective is paramount. Since this is not the only factor that can impact light transfer and the other factors that can improve low-light shooting, picking an exactly sized objective can be difficult. The best bet is to compare scopes of similar power. You will always find objectives tend to run the same among different brands but if one is excessively small or large, do a little more investigating to see why. If you can’t find a reason, move on to a different optic. Getting the best out of your optic will require a reticle that works for you. There are a number of styles that excel at different purposes. Some are very simple while others may seem overly complex. If any factor of choosing a scope should be paramount, it is picking a reticle that serves your purposes. These are the most common reticles used for hunting and recreational shooting at shorter distances. The crosshair has no way of estimating bullet drop over range while the duplex has only a slight change in line thickness for rough estimation. The inability to range straight from the reticle is a definite weakness but the opposed strength is in ease of use. Without any complicated markings, your picture is perfectly clear. With a .308 out to 200 yards or so, these are a good option. They work well for the hunter and casual shooter but if you want more out of your rifle, go for a more complex reticle. When it comes to an all-around good choice, the military has always opted for scopes that have markings for estimating range. There are several forms of this reticle in common use but they all rely on the same principle. As long as you understand the premise of the markings and have something of a known height, you can measure the distance to any target from the scope. This does take some skill but it’s a skill worth developing. If you hunt or shoot recreationally, you are likely to end up in a situation where you don’t know the range to a target. Being able to figure out the range will make you a more accurate shooter overall. These are the most complicated crosshairs but can be worth it. Most hunting occurs in the lower light conditions of early morning or late evening. Home defense situations are often in poor lighting conditions. There are ample reasons to explore scopes that have illuminated reticles. The downside is always battery usage but that is usually a very small amount. Some optics can run in excess of 10,000 hours on a single set of batteries. There is also a small weight difference between illuminated optics and regular optics. Whether an optic with an illuminated reticle is right for you or not depends on when and how you plan to use your rifle. Consider the option and weight the cost differences. If a scope suits your needs otherwise, having illumination only makes it more versatile. Included in our recommendations you will find both types of optics. Each has their pros and cons. Understanding the types of optics and their uses will help make the best decision possible. These sights have little to no magnification and use a projected dot or reticle on an internal lens for the purposes of aiming. Without a doubt, red dots & holographic sights are the fastest sights out there, often allowing faster target acquisition than any other sighting choice. You will see a lot of numbers thrown around as to how much faster but realistically it's probably around 40%. Because they have no magnification, they are a poor choice for anything farther than medium range. They excel at closer distances and are a perfect choice for home defense and hunting in enclosed spaces like thick woods and brush. If you won’t be engaging targets at a distance, this is probably the best sight choice. A normal scope has some level of magnification which could be as low as 2x or as high as 40x. They are made for precision work, no matter how powerful they are. Even a 2x scope can get you past 100 yards with relative ease. However, they are very slow and get slower the more powerful the scope is. Generally, you want a conventional scope only on a rifle that will be used for medium to long range. Once you get inside 25 to 50 yards, you will have trouble locating your target unless you scope has very low magnification. If most of your shots will happen in excess of 50 yards, a conventional scope is probably the best bet. The HS-T (Hunting & Shooting Tactical) line of scopes from Vortex are some of the most respected and best-rated scopes on the market. A distinction that they very much deserve with the absolute top of the line construction. If you need maximum accuracy over long range, this is how you get it. Everything about this scope is built to exacting specifications by one of the largest optics manufacturers in Japan, the same that makes Nightforce scopes. While this does come in well under budget for what you would expect to pay for such an optic, it is by far not a cheaply made scope. From the 1” tube to the multi-coated, exceptional lenses, you are getting everything you need for supreme accuracy at a great price. This particular model has a variable magnification going from a modest 6 power up to an astounding 24 power. Combined with a second focal plane MOA reticle, with a little practice, you can range out targets and easily get those 800-yard shots the .308 is rated for. When it comes to extras, you get side focus for parallax, Armortek lens coatings for scratch resistance, and zero-stop elevation adjustment on full turrets. The internal is argon purged and sealed for weather resistance and life-long performance. If you are after a top notch scope that isn’t going to set you back a fortune, this is it! Several Nikon scopes have been leaders in the optics world for a long time. Specifically, the Monarch and Pro-staff series but if you are going with a .308 rifle, why not go for a scope built for that round? Based on their past successful models, the M-308 is easily among the best scopes around for a SCAR 17. The primary strength of this scope is the setup of the turrets specifically for a .308. When combined with Nikon’s own BDC reticle, you should have no trouble getting your rounds on target at any range out to max. This is Nikon’s guarantee for the modern tactical rifle, a scope that can get your dead on without all the fuss of most other scopes. All Nikon scopes use a proprietary multi-coat that keeps the bright with great color saturation but most people feel that is there only strength. As a combat optic, Nikon has been a little frowned upon in the past. That changes with the M-308. This scope is fully waterproof, fog proof, and shockproof. Not only will it stand up to the recoil of a .308 but it can take the abuse of being in the field. Though they may have never topped off the recommendations for a solid field optic, this Nikon changes that. It's accurate, rugged, and has everything you need to get your shots on target at any range. All of this in an easy to use and easy to sight-in package that is well worth the price. For decades, Aimpoint has been the king of red dot sights. Beating out the ACOG in the minds of most people. Both the military and police have and still, do use a variety of Aimpoint optics with the PRO being the choice of many police agencies. This is an optic that was designed for hard use and can take a beating without suffering any negative effects. What makes Aimpoint sights so amazing is their battery life. In the case of the PRO, you can leave this sight on for 3 years on a single battery and never see a degradation of brightness. It was actually designed to be always on so it was quick to grab and use without the need of a switch to slow you down. It does all of this with a cheap 3v lithium battery. The dot on the PRO is 2 moa which is among the smallest of any red-dot sights. This is great for accuracy at decent ranges while still being visible enough for fast target acquisition. There is a reason that police prefer this optic when their life may be on the line. It is versatile and just works well all the time. If you are after the premier red-dot, this is what you want. Its small, light, accurate, and will greatly improve your shooting speed. There may be red-dot sights out there as good as an Aimpoint in one way or another but none combine it together. 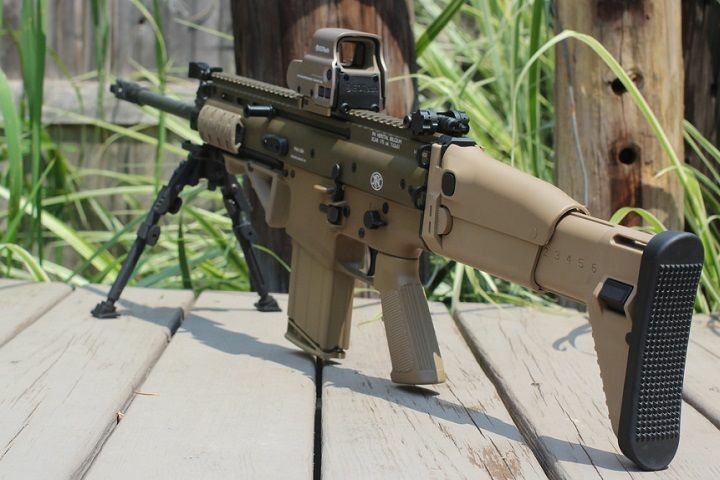 All-around, this is such an amazing optic for your SCAR 17. In the same world as red-dot sights, holographic sights provide much the same functionality but have a little more to offer where reticles are concerned. They are somewhat less durable but not easily broken. While EOTECH did not invent the holo sight, they did revolutionize it over 20 years ago and they are still the industry leader today. The number one advantage of a holo sight is getting a reticle that is more than a dot. In the case of the model 512, that means you get a 68 MOA ring with a 1 MOA dot in the center. This provides the shooter with the most accurate platform possible without costing any target acquisition speed. If you aren’t the type to throw your rifle around, this is the best of both worlds when it comes to short to medium range. That is not to say that the EOTECH is easily broken. It is water resistant and can take a 10-foot fall onto concrete and still function flawlessly. It's just less robust than many red-dot sights that are much less complicated in function. The 512 even comes with a 10-year warranty just in case. A favorite of many competition shooters and perfect for home defense and some hunting applications, the EOTECH is a simply amazing sight. It is also very versatile with 20 brightness modes for shooting in any lighting conditions. Best of all, a single lithium battery will power it for over a thousand hours. There was a time that Vortex was considered to be a budget offering in the optics world but that is quickly changing. Their prices are still lower than most top of the line scopes but their quality and innovation continue to improve. In the case of the Spitfire, this is a very successful attempt to blend a scope and red-dot sight. Like a standard scope, this has some magnification and a standard reticle but this time has added illumination so it functions much like a red dot. While the 3x won’t get you long range shooting, it will definitely get you enough range to take advantage of a .308 round. All the while allowing you to acquire targets faster and be more precise than most other red-dot sights. The Spitfire has everything that makes Vortex scopes great. It comes with premium multi-coated lenses and nearly bomb-proof construction. On top of that, it adds 5 different levels of red and green illumination for shooting in any light conditions. All the while it is waterproof and shockproof enough to handle field conditions. This is just an optic you have to try before you understand just how good it is. It may not be the best red-dot and it isn’t the best standard scope but it is a solid blend of the two. For precision and speed, this is a great choice for any tactical rifle and can be used in many hunting situations. Before Vortex took over the market, Primary Arms was the king of great optics at a great price. How they manage to make such amazing scopes at such a great price is still a mystery but all of their optics seem to be great quality for what you pay for them. This lower powered Gen III scope with 1-6x magnification is a perfect match for a rifle intended to be used at short to medium range. You won’t be making 800-yard shots but out to 500 or so, you should be good on larger targets and you can get precision up to 100 yards. All the while the greater field-of-view keeps you from losing track of closer targets. For a SCAR 17, this scope is a great choice. It may not have the power you need for long shots but it was made for a .308 with a reticle designed to compensate for bullet drop from that caliber. This particular model is illuminated for dimmer conditions where more contrast is needed, making it an amazing choice for hunting and home defense. The body of the scope is aluminum which works well and it is overall waterproof, shockproof, and recoil resistant. This is no cheap knock-off but a real, affordable scope that can handle serious use. If it doesn’t, there is a limited lifetime warranty and great customer support. When it comes to bang for your buck, this is simply the right choice. Bushnell is one of the best known optical companies on the market, mostly for their hunting-related products. That said, the modern Bushnell has developed an outstanding line of optics suitable for competition and tactical needs, the Engage is one of those! Available in power options from 2.5-10x to 6-24x, you can get an Engage to suit most any need. For the SCAR, a max 10x is perfect for getting out to longer ranges without compromising short to medium range shots. Any power you choose, this is a stellar scope for those on a budget. Like all Bushell, the lenses are great quality and multi-coated for vibrant, clear images. It is sealed for waterproof, fog proof performance and has no trouble handling the recoil of the powerful .308 cartridge. It even comes with flip-up caps for added protection in tough environments. Unlike most Bushnell optics, this scope has turret adjustments as fine as 1 MOA and a reticle to match. Side parallax adjustment has been added for precise focus and lens coatings to repel water, oil, and dust are a standard. This is a serious scope without a serious price tag. The Prostaff series of optics by Nikon have been some of the best selling optics on the planet for years. Favored by hunters but used in many different shooting sports, the Prostaff is simply an all-around performer that can be purchased for unbelievable prices. For the SCAR 17, you could opt for a more powerful scope but the 3-9 Prostaff is a good match. Though the SCAR is quite accurate, it is not pinpoint accurate. A more modest scope that allows you to take advantage of the rifles speed while still getting decent long range shots is a perfect blend. Nikon is well known for is amazing glass. The lenses in the Prostaff are a perfect example of how much image quality you can get with good lenses and a great multi-coat. Even in low-light, images pop and have exceptional contrast for easy target acquisition. Being designed for the demanding shooter, the Prostaff is sealed and purged for perfect water and fog resistant and with a single-tube construction, it handles a .308 recoil well. You also get quick-focus on the eyepiece and a bullet drop reticle. Making this a great choice for the hunter, target shooter, and just about anyone else. There are three entries from Vortex on this list for two reasons. Firstly, they make so many models and types its hard not to find something that suits your needs. Secondly, they are very hard to beat when it comes to quality. The Crossfire is their budget scope designed to be used on rifles needing reasonable magnification without being overpowered. Though you can get the Crossfire II in a number of magnifications and reticles, the one we like specifically is the 4-12x with the MOA Dead-Hold reticle. This has reasonable capabilities in the medium range niche but plenty of power to max out a .308s range. Especially when combined with a premium glass that is as good as you can get on a scope of this price. Though you could use this scope for hunting or any other purpose, at its heart it is a tactical scope. It has everything you need for accuracy while still being tough as nails. You get turret adjustments on a 1” single piece tube. It is sealed, purged, and fully waterproof. Even fog and dust won’t cause an issue with this scope. If you need something great but you can’t afford the big name scopes, Vortex is your saving grace. They have a scope that exceeds the quality of most other scopes costing more while costing less. This is what has made Vortex and industry giant in the optics world. For a scope at the low end for someone who wants to get an optic for a very low price, it's hard to pick something that has good quality and performance. In cases like this, who better to go to than Bushnell? Their price is exceptionally low and the scope is incredibly good for the money. It may not be the best of the best but it is good enough! At 3-9x magnification, you get low-end performance for reasonably quick shooting while you still have enough power to get shots out past 500 yards with decent accuracy. This is assisted by Bushnell’s own Multi-X reticle which combines the ease of use of a multiplex reticle with more ability to compensate for bullet drop. Usually quality of lenses is the number 1 issue with cheaper scopes but the Bushnell uses the same great lenses for the Dusk & Dawn that it uses in their high dollar scopes. The image is clear and exceptionally bright which is by design. For hunters, low-light conditions are normal and this scope does very well in those situations. This scope is 100% water and fog proof and can handle the tough conditions of any normal environment. Bushnell has some of the industry’s best quality control and you can guarantee that tested this scope hard enough to back it with their warranty. Simply put, this is the cheapest quality scope on the market that I would trust to a .308. Getting the best optic for SCAR 17 isn’t difficult. As long as you have an idea of what you want your rifle to do, you can find a number of reasonable optics to suit your needs. Those above are the best of best short of getting into the premium grade optics. If you are after one of those, you likely know more than enough to decide without this article. But if you are reading this and your money is valuable, any of the above optics will provide you with a lifetime of shooting.